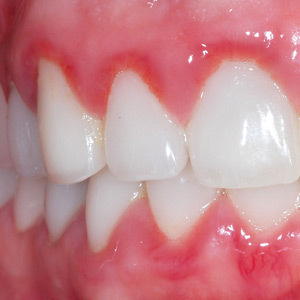 People with poor hygiene habits can develop a chronic form of periodontal (gum) disease known as gingivitis. Characterized by inflamed and bleeding gums, gingivitis is caused by an infection triggered by bacterial plaque, a thin film of food remnant built up on tooth surfaces. This chronic form of gingivitis, though, can quickly escalate into more serious forms of gum disease that may lead to tooth and bone loss. One such condition is Acute Necrotizing Ulcerative Gingivitis (ANUG), also known as “trench mouth.” ANUG is a painful condition that can appear suddenly and result in extensive tissue damage and ulcerations, particularly in the papillae, the small, triangular bits of tissue between teeth. Persons with ANUG may also develop a foul breath and taste. Gingivitis often develops into ANUG when certain mouth conditions exist: poor diet, smoking, which can dry the mouth and disrupt healthy bacterial flora, and increased stress or anxiety. If caught early, though, ANUG is highly treatable and reversible. After determining you have ANUG and not another condition, our first step is to relieve the symptoms with non-steroidal anti-inflammatory drugs (NSAIDs) like ibuprofen to manage pain and reduce swelling. We also prescribe a regimen of antibiotics like Amoxicillin (a proven antibiotic against the specific bacteria that cause ANUG). This should decrease the symptoms within 24 to 48 hours. As the inflammation subsides we want to continue treatment by removing any plaque or calculus (hardened plaque deposits), especially in hard to reach places. This involves a technique known as scaling in which we used specialized hand tools or ultrasonic equipment to manually remove and flush away plaque and calculus. The final step depends on you. To prevent reoccurrence, it’s important for you to consistently practice effective oral hygiene to remove plaque — brushing twice and flossing once each day, and visiting us at least twice a year for cleanings and checkups. Quitting tobacco and improving your diet will also reduce your risk for ANUG. ANUG and any other form of gum disease can cause a lot of damage. But taking steps to care for your teeth will help keep this acute form of gingivitis from arising in the first place.